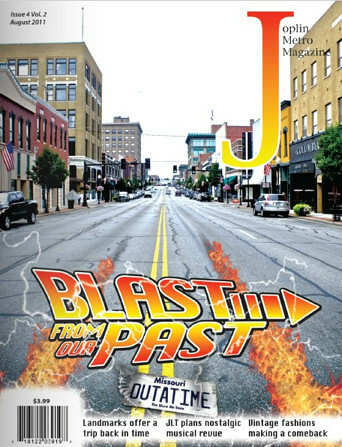 This month’s issue of the Joplin Metro Magazine has a number of Joplin history related articles. First is a profile of Hannah Simpson, who is selling postcards printed with images of familiar iconic and historic signs of Joplin to benefit the Trees for Joplin Fund. Next in the issue is the cover story, photographs of a number of Joplin landmarks relating to nearly every decade of Joplin’s history with brief histories. The topics range from the Inn at Reddings Mill to Junge Field, as well as such familiar buildings as the Scottish Rite Cathedral. Lastly, the issue wraps up its Joplin-centric history with a piece on the Mo-Kan Dragway. For those interested, the Joplin Metro Magazine can be found about town, published by the Globe, and online here. Vote for Cunningham Park in Coca-Cola’s Live Positively Park Contest! You can leave a response, or create a trackback from your own site. Those historic signage note cards were done by my daughter, Hannah! They’re available for sale at the Post Memorial Art Reference Library. This page took 0.222 seconds of computer labor to produce.